This guest performance in the New Media Scotland Twitter account during her residency in July 2008 featured a daily tweet for each day of the month— making a sequence of 31 silky lines mezangelle. _Twitterwurking_comprised of sequential “tweets” posted via a microblogging platform called Twitter. The work itself was written in my mezangelle language- a type of merging of programming languages/code with poetic elements. 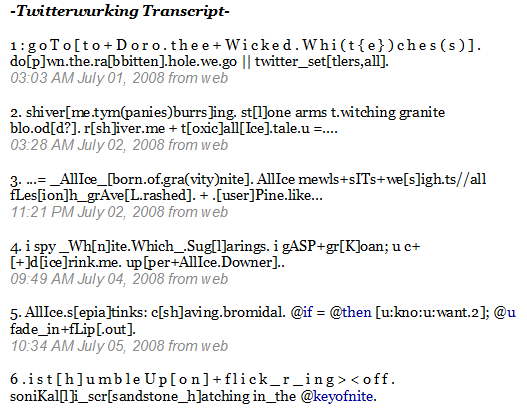 The Twitterwurk sought to incorporate specific users into the narrative by typing the “@” symbol before their name. The users were then made aware of this focused reply and thus deliberately enfolded into the tweetstream/project. The tweets tell a story seemingly inspired by Alice in Wonderland, The Wizard of Oz, Peter Pan, videogames, Twitter, Flickr, StumbleUpon, and Breeze’s own poetics, as seen in the lines quoted above. A key idea in her poetics is the leaky boundaries between code and screen representations of language, incorporating coding conventions, such as using brackets and snippets of commands (“goTo”). One way in which she deploys this is by using the @ symbol to create both a word and an automatic link to a Twitter user’s account, bringing them hypertextually into the performance. These accounts occupy prime spaces in Twitter real estate— at least conceptually— and Breeze brings two of them together (@if and @then) by using invoking an essential piece of programming: the conditional statement. The accounts themselves are unrelated to each other or to the statement, but Breeze joins them and places them in the company of @u an account dedicated to cat photographs and terse verbal descriptions of their location, but also “you” (the reader). As the narrative unfolds, Breeze continues to break the fourth wall (so to speak), and comments on the work in progress using her Twitter account. These tweets are currently unavailable due to Twitter’s limitations on users’ ability to search their content. One can only hope that she will download and publish her Twitter archives when she gets the opportunity, so we can access this piece of the work’s context. If you are new to mezangelle, I suggest you first read the whole thing, aloud, if possible. The re-read it slowly, focusing and unfocusing your mind’s eye on the text to allow words distributed in space to come together and lead you to moments of clarity. Your efforts will be rewarded!